Jared Jeffries doesn't travel for fun in the summer, like many NBA players do. He goes to some of the most remote places on the planet, and sometimes lives on boats a hundred miles off the coast to fish. On defense, Jared Jeffries is not afraid to routinely use his body against faster and stronger players, and he has the right timing and technique to stop them. This past season, Jeffries drew a total of 26 fouls and 10 charges -- both tops on the Knicks. The 6-11, 240-pound Jeffries is the same way out on the open water, where, as a worldwide fisherman, he takes charge against much heavier opponents. The largest fish the backup big man has ever caught, which he reeled in a couple of years ago, was a 750-pound black marlin off the coast of Puerto Vallarta, Mexico. "It was awesome," he told ESPNNewYork.com by phone recently. "A lot of it has to do with your boat captain, and how good your boat captain is. I had an awesome captain on that trip and he did a really, really good job of positioning me. I caught it in about an hour, because it takes that long." 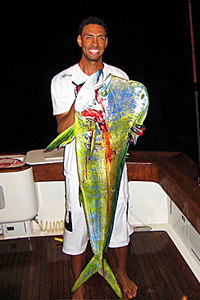 Jeffries with a mahi mahi in Punta Mita, Mexico. That's not Jeffries' only big conquest. He once caught a 275-pound yellowfin tuna in Puerto Vallarta, in addition to a rare 73-inch bluefin tuna in Cape Cod. 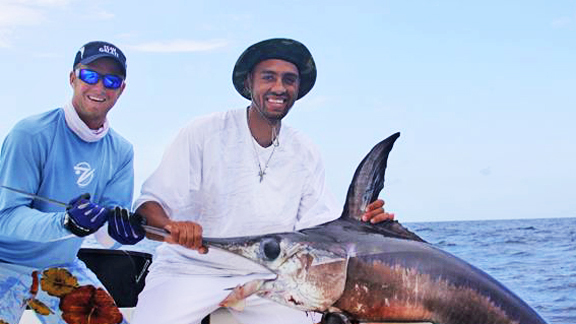 Jeffries, 30, is far from a casual fisherman; he might be the most committed and well-traveled one in the entire NBA. He brings his own rods, reels and a satellite phone on his trips, travels with a regular boat captain, Josh Temple, along with his wife and fellow angler, Jennifer, and visits four dedicated fishing websites to plan his next adventure. "I'm probably the only NBA player who goes on these sites," he said. Internationally, in addition to Mexico, he has fished in multiple areas in Canada, Costa Rica, Guatemala, New Caledonia in the South Pacific, New Zealand and Panama. In the U.S., he has fished in basically every state that borders the ocean or a gulf, including Alabama, California, Florida, Louisiana and the Carolinas. Just last week, Jeffries was 70 to 100 miles off the coast of Port Vila in Vanuatu in the South Pacific for seven days, where he was living on a 100-foot mother ship with Temple and a friend from Australia, fishing for dogfish tuna and giant kingfish. Temple does most of the planning for each trip, and for this particular one, Jeffries had to fly from Indianapolis, where he was hosting his annual basketball camp, to Detroit to Los Angeles to Auckland, New Zealand, and then to Port Vila. "This is very unique," he said. "The only time you live on a boat is if you go to really remote places and you're trying to get to out-camps that aren't really accessible very easily." "I heard about it from a friend and saw the ad in a fishing mag. You flew in by a twin-engine, four-seater crop plane to a prison island called Coiba Island in the middle of Panama. And when you landed on Coiba Island, the Panamanian prisoners got you off of the plane. There were only about five prisoners left on the island. They got you off the plane because they could make a little money. Then, you take a boat to like a parks and recreation camp, where you could fish around Coiba National Park. "The camp only had power six hours a day and it was like 98 degrees. I didn't sleep much as soon as the power cut off. The power was on from about 8 p.m. to about 6 a.m. in the morning. And when the power cut off, it got so hot in there you couldn't breathe. "It was crazy, dude. There were snakes everywhere. I'll never, ever go back there. Ever. I was so scared out of my mind. You slept in an old military bed. There was like a 15-foot crocodile around. It was crazy. The park rangers protected the park. They had guns. About three years after I left, that same crocodile tore one of the rangers' arms off. "I'm telling you, it's like in the middle of nowhere. However, the fishing in Panama is always good. I mean, you catch all kinds of fish. It's amazing. It's just an adventure." 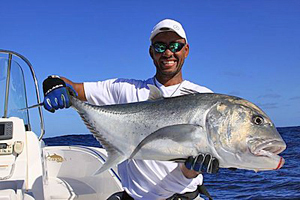 Jeffries with a giant kingfish in New Caledonia in the South Pacific. Jeffries said he's all about the challenge and getting a chance to experience different cultures, as well as hang with the locals. In Port Vila, he took part in a Hawaiian-like luau, where he helped roast a pig and danced with some of the villagers. "I love it," he said. "I love going to new places. I love catching new fish. You might try to fish for three hours, four hours -- you never know." Jeffries fell in love with fishing through his father, Tom, while growing up in Bloomington, Ind., where they frequented lakes, rivers and small ponds. But his love for the sport didn't take off until Jeffries moved to the coastal city of Bradenton, Fla., to train at IMG Basketball Academy for the 2002 NBA draft, after forgoing his junior and senior years at Indiana. Early in his career, he bought a house on the water in the Tampa area, where he now has two boats, 39- and 24-foot Yellowfins. In mid-July, Jeffries will take out one of his crafts to fish with Jeremy Lin, who caught a marlin in early June in Cabo San Lucas, Mexico. Lin, who tweeted a photo of the marlin -- which he released -- will fly down to Florida after he completes his time with the USA Men's Select Team in Las Vegas. "He said that he can fish, so we'll see when he comes down to my house," Jeffries said. Jeffries' favorite type of fishing is deep-sea. Sometimes, he travels up to 123 miles off the coast to catch and release. (He doesn't cook the fish; he usually eats what's prepared by the captain or staff on board the vessel.) He also enjoys being that far out to escape from technology. "It's just very simple," he said. "There's not a lot of luxury or thrills to it, but if you love to fish, it's fun, man, because you just kind of chill. It's real relaxing, no cellphone service. It's amazing." Jeffries said he's been approached about appearing in different fishing shows, but he's selective about what he wants to film. "I want to be on a real fishing show," he said, "like a fishing network." Jeffries said he'll continue to fish mostly during the summer months, but has no plans to become a full-time fisherman anytime soon, because he wants to play basketball for a long time. Will that be in New York next season? He said he would "hate to leave right now." "I know that the Knicks are interested. I love New York," he said. "I'm still proud that I've been part of back-to-back playoffs. I feel like we made improvements this year as a team. That's my ultimate goal. I want to improve, I want to get better. I want to be on a winning team, and I think we have a chance to do that." Jeffries' Top Three Fishing Destinations in the U.S.
1. Venice, La. : "It's the best for fishing. Inshore you have the best trout and red fishing. Then, once you go offshore, you have yellowfin and blackfin tuna, marlin, snapper, grouper, mahi mahi and even swordfish." 2. Panama City, Fla.: "It has most of the same fish as Venice, but it can be hit and miss sometimes. But Panama City is great for families, whereas Venice, La., is mostly for fisherman." 3. Hawks Bay in Duck Key, Fla.: "The best swordfish fishing in the world right now is there." Internationally, Jeffries recommends Panama as the best -- but not at the out-camp he went to on Coiba Island. "Probably the best place in the world for variety of stuff to catch I would say is Panama, and it's easier to get to," he said. "Panama is amazing because of the size of the marlin and tuna, as well as the numbers of fish. You can also catch cubera snapper and roosterfish."